Seeing your dogs (or cats) constantly licking at a wound or sore can be distressing, especially knowing that your beloved pet is likely to make the problem worse and cause the area to become inflamed and infected. For years pet owners have used Elizabethan Collars (the ones that look like giant cones!) 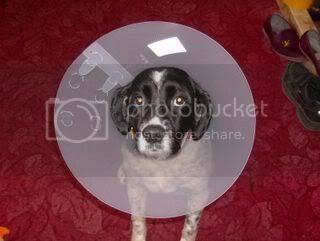 to try to solve this problem, but many pets can find it very upsetting having to wear these cumbersome cones. Now Nurtured Pets Anti-Lick Strips may offer you and your pet an alternative. They are the first all natural 'pet plaster' which helps to deter obsessive licking, biting and chewing in pets. The Anti-Lick Strips are basically a large clinically and veterinary approved sticking plaster which has strips of natural active ingredients along it. These include cayenne pepper, oregano, lemon powder and clove oil which obviously would taste pretty disgusting when licked. This should stop your pet obsessively licking, biting and chewing their skin. It can be used as a preventive measure to stop skin irritation, or to protect existing sores or wounds. I wish these were invented years ago, they would have made life alot less stressful for our beautiful Springer, Pippa, who is sadly no longer with us. She had a big operation to remove a lump from her leg, and absolutely hated having to wear her 'cone'. As soon as you put it on she used to freeze, bless her. As you can see from the photo below, she did not look happy! As Pippa got older she also developed a habit which proved very difficult to stop - obsessively licking her paws so that they became bald and red raw. In the end, after veterinary advice, we had to resort to tying socks onto her paws. This obviously was uncomfortable for her, and she was very good at removing them. I think the Anti Lick Strips would have been great for Pippa, as they can be wrapped around paws or legs to try to break habit. The lovely people at Nurtured Pets kindly sent us a sample pack to try on Bandit. He suffers terribly with summer allergies and gets very itchy skin. He constantly nibbles and licks at a specific area on his back, and has managed to cause a small sore spot. As soon at it heals over he manages to open it up again, it has been a never-ending cycle over the last few weeks. So we decided to use the anti-lick strip to try and get this spot to heal once and for all. The strip shouldn't be applied to open wounds, but can be used over a piece of gauze or bandage, or can be used around the area. We decided it was best to leave Bandit's spot uncovered to heal naturally in the fresh air, so cut off small pieces to place around the wound. They were easy to cut up and stuck well to Bandit's short fur. Bandit's face when he tried to lick the strips was an absolute picture! He soon learned his lesson and they completely stopped him (and Skipper!) from licking the area. I was impressed at how long the strips stayed on, lasting a few days before they started to fall off. One time the strips got soaking wet in the rain and they still stayed put! We used them for a couple of weeks until the spot healed completely. Brilliant! They are fantastic and worked really well for Bandit, we'd definately recommend them. We will be purchasing another pack and putting them in the doggie first aid box 'just in case'. With such active (and accident prone!) dogs as Bandit and Skipper you never know what war wounds they're going to have next - a cut paw, an insect bite etc - so this will be an excellent stand-by product in case of an emergency. If you think the Anti-Lick Strips could help your pet, please take a look at their website for more information.